Although the above poem by Mary Oliver is titled “Today”, in my head I’ve renamed it “Trust”. This poem brings to life for me the felt-experience of in-the-moment trusting. The sensation of hunkering down into the quiet fortitude of faith. An experience we’ve been getting intimately reacquainted with behind-the-scenes at 8 Limbs, whether we’ve wanted to or not. 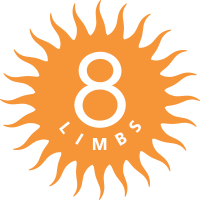 For many years (20 to be precise), we’ve turned to our practices to help us navigate life, including the life of 8 Limbs. In moving our bodies and sitting with our selves we’ve honed our capacities to approach situations with deeper humility, openness, and compassion. In turn, this has allowed us to savor moments of joy as they arise, and accept what life (and business) doles out that is difficult. Over these 20 years a predictability of sorts emerged. We’ve noticed a consistent practice generally means we feel better, more of the time. We’ve also found that life’s rough patches dissipate sooner; their edges soften. For about 19 of these 20 years we’ve taken comfort in this predictability. Why only 19? The experience of 2016 (to be precise). Within 8 Limbs, as many of you know, we had committed 2016 as a year to hold difficult conversations. Many of you also know, we have since often found ourselves in over our heads. As a member of the Seattle yoga community, we’ve joined others in confronting and getting confronted by racism and bias that is far more extensive and deeply rooted than we had imagined. In our nation, we’ve watched this play out tenfold. What then have we done? We’ve turned to our practices. Intellectually we clued in that a socially-just life is a yogic life regardless of how it feels in our bodies in any given moment. In our bruised insides though, if we’re honest, we turned to our practices because we wanted to feel better. We wanted to gain the insight necessary to move past this unwieldy and festering rough patch. When that wasn’t returning us to equilibrium as quickly as we were used to, we turned to an enticing old friend: doing more. We started programming more events and offerings without retiring others. Doing more keeps us busy, helps us feel engaged. Our insides were hoping this extra practice would speed up the healing process and grow our communities into safer places sooner. And there’s the rub. We’ve been willing to trust our practices so long as we weren’t planted in difficult territory for too long. Through experiencing a general predictability of more ease and less pain, rather than allow experiences to unfold as they are, we came to expect relief from our practices, at least within a certain amount of time. And we’ve been squirming; we are squirming. If you can picture in your mind’s eye a yogi sitting on a cushion desperately trying to meditate, fidgeting, agitated…that would be us a decent chunk of 2016. Anyone who regularly reads my column knows we are a work in progress. This column is a monthly peek into that not-remotely-linear progress. Sometimes we’re in a good place, sometimes not so much. What you’ll always learn, though, is where we are at any given time. One year after committing to difficult conversations, that place is committing to trusting the inherent goodness of our practices. What do we mean by that? We mean not simply trusting our practices when convenient, timely, or when they make us feel good quick enough but fully putting faith in the moment-to-moment experiencing of our practices. We mean trusting that our practices will, in their own way and in their own time, lead us, individually and collectively, to deeper levels of wisdom and compassion. Trusting that just because we are residing in discomfort for an uncomfortably long period of time doesn’t mean our practices aren’t enough. We call it “strategic pruning.” We’re aligning our energy behind both what we can reasonably pull off with heart and presence and what most brings our mission to life. This means scaling back the quantity of workshops and special events within each schedule while upping cohesiveness. For example, rather than bringing in social justice trainings in addition to an array of asana-based workshops, we’re creating programming that yokes these two paths. We’re also simplifying some of our key programs. We will still hold our annual 28 Day Commitment program in February, for instance, but in a quieter format. We’ll also use our 28 Day Commitment as a platform to unpack this idea of trusting in the goodness of our practices as a broader community. More details to come in January. In the meantime I invite you to consider what about your practice you are willing to trust today (Mary Oliver’s word). As always, feel free to share your thoughts and questions with me at ashley@8limbsyoga.com.